Deal Book. China’s Shuanghui International Holdings Limited has concluded a deal to buy Smithfield Foods Incorporated for cash at $34 per share and a total cost of $4.7 billion (The Associated Press, May 29, 2013, China’s Shuanghui buying Smithfield Foods for about $4.72 billion, taking company private). That’s a +30% premium over the current stock price of $25 and a +60% premium over the current Risk Price (SF) of $23. Please see Exhibit 1 below. The “Lawyers Without Portfolio” (LWPs) are already agitating and wanting to determine for the shareholders who they have never represented, if this is a “fair” deal or not. They are bringing out the canons because an unnamed stock analyst has suggested a “fair value” of $48 per share (please check the company news; we don’t want to draw their fire – it’s annoying and there are already so many of them in the “sand tick” season of protein seekers). The Continental Grain Company, also known as the ContiGroup Companies Incorporated, one of the largest privately held firms in the US with about 14,000 employees and revenues in excess of $14 billion per year, has also stated its intent to file a proxy solicitation (SEC Schedule 13D) suggesting that by re-structuring the business, the share price could be $40 within three years and they have called that an initiative to unlock shareholder value, and it is because of that “initiative” that Smithfield is on the block today. Gentleman, cool your jets. You’re blowing smoke and you don’t know what you’re talking about. Having said that, we now draw up our defenses. First of all, in Stocks 101, we point out that a stock isn’t worth anything if no one wants to buy it from us. In the case of Smithfield there are 139 million shares outstanding with a par value of 50¢ per share and nobody owns more than 10% of them; the ContiGroup might own as much as 6% of them and is said to be the largest shareholder with an equity interest of $216 million at the takeover price and $190 million at the ambient stock price of $22 to $23 in March; and they’re talking about $330 million in three years time if their program is successful and produces +30% per year in stock price increases for the next three years. Where are the buyers? What is their dividend program? And what is their offer to buy the company if they see so much “value”? The LWPs suggest that “fair” means that Smithfield’s Board “has attempted to obtain the highest share price for all the shareholders before agreeing to the deal”. And what is the “highest share price” if the current owners of large blocks are unwilling to pay more than $23 per share at the present time; or even accumulate more of the stock at $23 or less in the last three years for a company that was trading at $10 to $15 in 2009 and significantly off its price of $25 to $30 the year before? If there is a higher price, produce it, and the Board can help to determine if it’s better deal for all the stakeholders, including Smithfield’s suppliers, customers, and 46,000 employees. 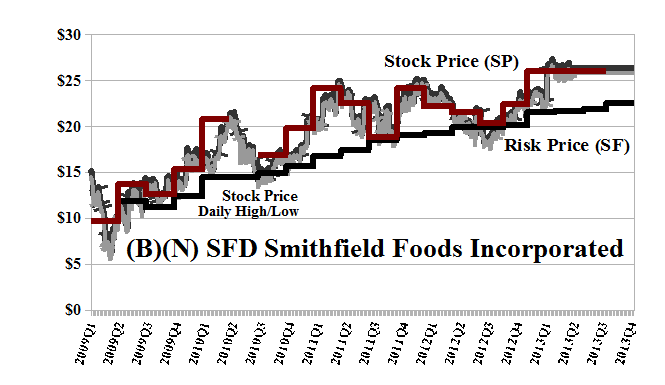 To answer these questions, and leave no room for argument, we note from the Chart, Exhibit 1 below, that Smithfield has almost always been trading at a premium to its Risk Price (SF) and that the ambient stock prices summarized as the Red Line Stock Price (SP) have tended to exceed the Black Line Risk Price (SF) which is our best estimate of the “price of risk” at that time, given the known factors of the company’s balance sheet and the known factors of the investor response to it, regardless of the earnings, which at times, such as in 2009 and 2010, were negative, and during which time the stock price increased from $10 to $20. For an investment, the only “fair” price is the price that is “as good as cash” and “better than money”, and that is the “price of risk”, and anything in excess of that is “goodwill” and reflects the belief that those investors who are willing to pay that price believe that the company will earn it. Please see the references below. Smithfield Foods Incorporated is a brand name (Eckrich, Armour, Farmland, and Smithfield) and produces and markets fresh meat and packaged meats products both domestically and internationally. The company conducts its operations through four reportable segments: Pork, Hog Production, International and Corporate. From the Company: Smithfield Foods Incorporated together with its subsidiaries, engages in the production and marketing of fresh meat and packaged meat products in the United States and internationally. The company is involved in the production of hog; and various fresh pork, beef, poultry, and packaged meats products comprising cooked hams, sausages, hot dogs, bacon, and canned meats. It sells fresh pork to retail customers as unprocessed meat; trimmed cuts, such as butts, loins, picnics, and ribs; packaged meat products, including smoked and boiled hams, bacon, sausage, hot dogs, and deli and luncheon meats; specialty products, such as pepperoni and dry meat products; and ready-to-eat prepared foods comprising pre-cooked entrees, and pre-cooked bacon and sausages. The company offers its products to supermarket chains; wholesale distributors; the foodservice industry, including fast food, restaurant and hotel chains, hospitals, and other institutional customers; export markets; and other further processors. It sells its products through salespersons and independent commission brokers. Smithfield Foods Incorporated was founded in 1961 and currently has 46,000 employees, and is headquartered in Smithfield, Virginia.